There are orb webs and there are orb webs. Many spiders, having spun their death traps, construct a lacey ring of zigzags or an X-shape around the centre of the orb using thicker strands of webbing. Despite the name, the pattern is thought to have little role in stabilising the already taut and tightly-woven web. Arachnologist Rainer F. Foelix regards stabilimenta as camouflage tools, as they are made only by species that sit in the hub of their webs. The little orbweavers known as Cyclosa attach bits of debris and dried prey to their stabilimenta to raise the camo-quotient, while the spider huddles up in the midst of the mess pretending to be a piece of dirt. 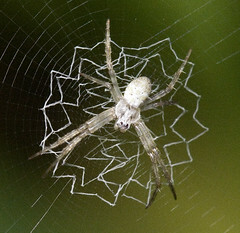 The coastal arachnids known as Argiope or St. Andrew's Cross spiders have X-shaped stabilimenta that are believed to serve as red light signals to prevent birds from crashing into the web. The spiders themselves hold their legs in pairs in alignment with the cross. 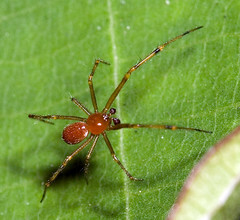 The same leg position is adopted by the little white spider in the picture above, which had built a tiny orb web on the underside of a broad leaf (on the upper half of the leaf dwelt a little red spider with an exposed web). It's not listed in Joseph Koh's guidebook but I suspect it's a a pale and ghostly cousin of the larger Argiope spiders. Living as it does in the shade, the stabilimentum probably plays no role in offering sunscreen protection or luring flying insects. Some researchers suspect that in fact, the device is merely the result of surplus silk that the spider is compelled to extrude and dump in its immediate vicinity; a case of one thread too many. The scarlet spider on the flip side of the leaf has prominent paldipalps and sits in a whisp of a web built across the centre of the blade. It probably catches insects that happen to land on what appears to be a safe platform. How it eludes the attention of both prey and predators is uncertain though, as the animal is not shy and its bright coat stands out smartly against its emerald home.